While I was working on the research for the wife of Capt. Waterman CLIFT, I discovered that there are several family trees at Ancestry.com who state that his wife maiden surname is Howard. I hope they see the gravestone I put there that clearly states her name as Esther HAZARD. Gravestones are not always correct but in this case, I feel reasonably sure that I am correct about her maiden name. While preparing supper, I thought about where I might find out more about her. (Oh, you don't think about gravestones while cooking?) So, after we ate, I went back to my office and looked over what I had gathered so far. The 1860 census tells us that Esther was born in Westerly, Rhode Island so I was hoping I would find her in the Hazard Genealogy. Ancestry.com holds a copy of this Hazard Genealogy [Ancestry.com. The Hazard family of Rhode Island, 1635-1894 : being a genealogy and history of the descendants of Thomas Hazard, with sketches [database on-line]. Provo, UT: The Generations Network, Inc., 2005. Original data: Robinson, Caroline E.,. The Hazard family of Rhode Island, 1635-1894 : being a genealogy and history of the descendants of Thomas Hazard, with sketches of the worthies of this family, and anecdotes illustrative of their traits and also of the times in which they lived. Boston: Printed for the author, 1895.] So, I searched for her husband's name and, "Yippee! ", there she is on page 108. I printed the page, left my office and went down to my couch and looked it over. Guess what I found out? 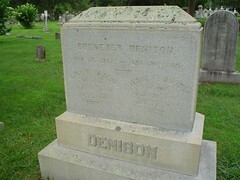 Esther was the sister of Mary Niles HAZARD, first wife of Ebenezer DENISON! This is her gravestone with her husband and his second wife. This gravestone is in the adjoining plot to Esther but many gravestones away. This is gravestone sleuthing at it's best. Such fun! Alas, nothing is perfect. Although I am sure this is her #1030 Esther Hazard, born May 30, 1817 wife of Capt. Waterman Clift, it lists her death date as Aug 31, 1851 which we can see is clearly not correct. But, it is remarkably similar to the date she married Capt. Waterman Clift which is 31 Aug 1835 [source: Barbour Index, Stonington, CT]. Mary Niles HAZARD and her sister Esther were the daughters of Joshua Hazard and his wife Elizabeth. They were 1st cousins! Elizabeth's parents were Silas and Esther (Hazard) NILES. Last night when I was cooking, I thought, "Darn! I forgot to add the chicken broth to the salmon!" My husband descends from Thomas Hazard both through daughter Hannah and son Robert. New discoveries are always fun!